An almost 1.15 meter long thigh bone is one of the largest items. Experts believe it belonged to an approximately 50-year-old male mammoth. Photo: Paleontologist Sergei Leshchinsky, leader of the expedition to Volchya Griva. A record number of bones of extinct animals, primarily mammoth, has been discovered in Siberia. According to preliminary research, the mammoths died en masse due to a lack of minerals. However, the remains of stone weapons suggest that they could have been killed by prehistoric humans. Experts at Tomsk State University (TSU) in the Siberian city of Tomsk located 2,900 kilometers east of Moscow, have found Eurasia's largest burial site of mammoths and other extinct animals. The place is known as Volchya Griva, located not far from the city of Novosibirsk. During a recent dig paleontologists found an unprecedented number of vertebrae, ribs, bones and other organic remains. In some places the concentration per square meter exceeded 100 items. The bones of young and adult mammoths, at least eight separate animals, were buried at a depth of between 1.7 to 2.1 meters. An almost 1.15 meter long thigh bone is one of the largest items. Experts believe it belonged to an approximately 50-year-old male mammoth that weighed more than six tons, and with a height greater than three meters. These skeleton remains are believed to date to between 25,000 and 30,000 years ago. 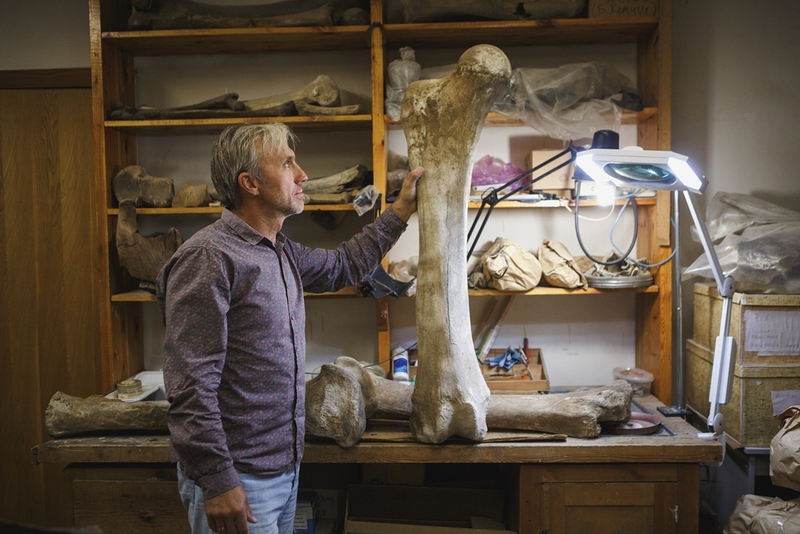 Paleontologist Sergei Leshchinsky, head of TSU's laboratory of Mesozoic and Cenozoic ecosystems, and leader of the expedition to Volchya Griva, told RBTH that there are several theories explaining the mammoth remains in such large concentration. "There are several points of view," Leshchinsky said. ``According to the most common theory, mammoths somehow fell into a natural trap; for example, Griva was an island that was subsequently flooded and then the animals died of hunger. Another point of view is that they were killed by humans. This hypothesis is supported by items found during the digs, such as stone weapons." TSU experts also proposed a third theory – more than 10,000 years ago there was a salt outcrop on the Paleolithic site, and animals suffering from a mineral deficiency flocked to it. "Animals sought certain areas to quench mineral deficiencies," Leshchinsky suggested. "For example, they ate plants containing vital elements -- sodium, calcium and magnesium. During major migrations, when hundreds of animals were in the same area, one or two mammoths could have died for various reasons, including due to predators." In total, the expedition discovered 785 bones that must still be analyzed. In addition to mammoths, there are many bones that belonged to bison, horse, fox, and rodents. "The entire find will be studied at the university," Leshchinsky said. "Bones need to be cleared, dissected, packed and assigned with numbers. We will be doing it all year long, and we will send the most interesting findings for radiocarbon analysis to determine their exact age." The Institute of Archaeology and Ethnography at the Russian Academy of Sciences will help prepare the samples, which entails the separation of collagen from the bones that is later burned to be converted into a "tablet" for dating. Radiocarbon analysis will probably be done at the University of Georgia in the U.S.
"We can only fully study this unique collection when there is sufficient funding because radiocarbon analysis is expensive," Leshchinsky said. Nevertheless, scholars plan to continue digging next year because they are certain that much more can be found at Volchya Griva.